~Tails from the Foster Kittens~: Anyone in North Dakota want a pair of kittens? Jim Johnson is looking for a home for a pair of kittens he rescued from hornets. It is an absolutely wonderful story, and Jim has made many kitty lovers very happy by sharing his story. I know he made me smile pretty broadly despite the fact that there were originally three kittens in this story. Jim heard mewing, and found three kittens in a window well covered in hornets. One was mewing, two were motionless. He decided the only way to save them was to tick the hornets off so much they went after him and not the kittens. Thank you Jim. I hope you are able to find a wonderful home for the two of them. What a brave man, it just goes to show that there are still heroes out there! Poor little babies. We're sorry the third didn't make it, but we think Jim definitely is a true hero! Connie, thank you so much for sharing the story. 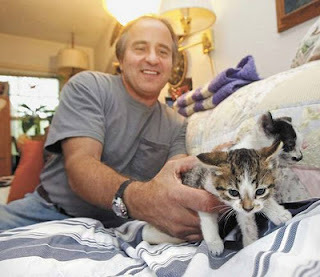 A happy ending thanks to a very brave man..stung 20 times to save kittens! Wow!